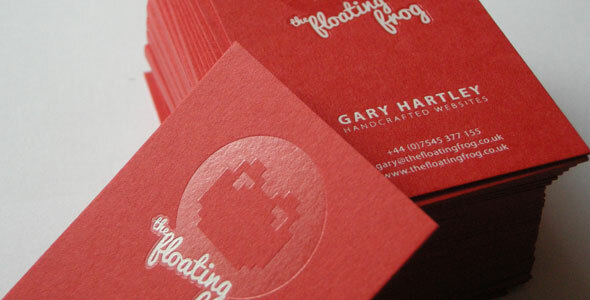 We’re firm believers that the quality of your business card is really important. Head over to our ‘First Impressions Count’ page for some insight into why having a special, high quality business card can help reap huge rewards for your business. 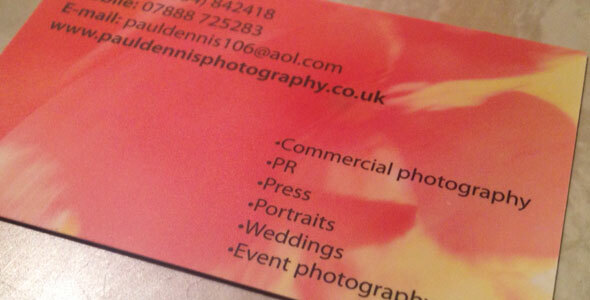 We specialise in producing business cards of the highest quality – read below to find out more! Why are our business cards different? 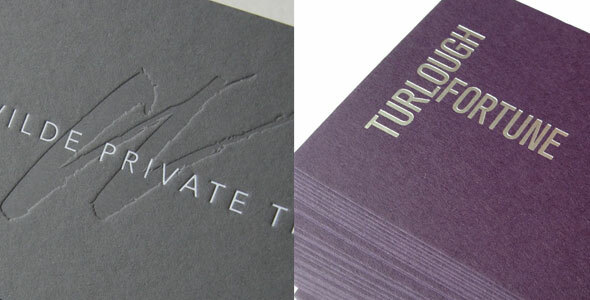 Our Individual range is produced on special ultra-thick 540gsm or 700gsm textured card. This is a very high quality card, which comes in a wide variety of colours – including duplexed (two cards of different colours, bonded together) – and has a beautiful, completely matt finish, and a wonderful luxurious natural texture running through it. The thickness and quality of the card will really help you to stand out and be remembered, showing that you’re really serious about what you do; and this is sure to tell your clients that you’re a special and professional business that they can have confidence in. A variety of special and unique features can be combined to create a really stunning and exclusive business card. The possibilities are almost endless, and you can combine your chosen card colour(s) with features such as letterpress foiling, blind debossing/embossing and edge painting, to create a special business card that is memorable and shows your clients that your business is different, with your business card standing out and being more likely to be kept and shared with others. To see the options available on our Individual range, please have a look at our Individual business cards page. Our Premium range is produced on luxury 400gsm or 580gsm silk art board. This is a high quality, thick (well above average) card. Compared with thinner and lesser quality cards, the thickness and quality help show that you’re serious about your business, and the professional image this gives will surely benefit you, meaning your clients are more likely to take notice, and contact you. Lithographically printed, full colour. 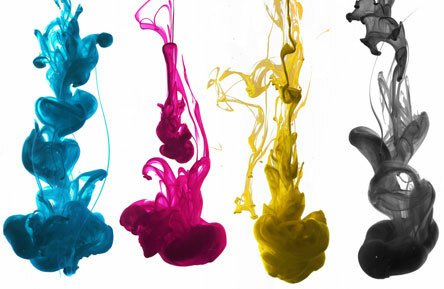 Unlike many of our friendly competitors, who are now increasingly turning to digital print predominantly due to cost savings, we still use full colour lithography – utilizing only the very best and latest printing equipment and processes – to print our Premium business cards. This gives the highest possible print quality – providing razor-sharp text, and amazing detail and definition for photos and graphics – and helps to portray a professional, slick image of your business. Matt lamination. A subtle matt lamination is applied for the perfect finishing touch. This gives the cards a wonderfully tactile, silky-smooth finish, which is a pleasure to hold and makes the cards even more special. It also has the added benefits of increasing the perceived quality and thickness of the card, as well as helping to protect it from damage from e.g. the weather and creasing, making sure that your first impression really does count. Our small, dedicated team have been in the industry for many years, and our experience shows. The skill, knowledge, experience and insight required to produce e.g. 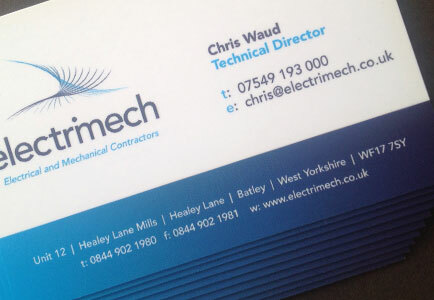 a specialist foiled or debossed business card of a high standard shouldn’t be underestimated. The processes involved require a huge amount of expertise in order to get the best results, and we strongly believe that our experience, skill, care and attention to detail put us in the unique position of being able to produce a truly premium business card for you which is unrivalled in quality. 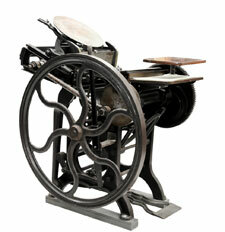 An antique letterpress printing press! Our production team uses a range of small, specialist machines for orders of more modest quantities, which is operated completely by hand and means that we can offer a very personal and bespoke service, with each card hand-pressed multiple times for the different colours and options being used. Larger quantities – so that we can offer you very competitive prices – may be produced using our team’s specialist letterpress foil presses. With both machines, we always go the extra mile to ensure we get the very best results out of each and every job – including rigorously testing and making and advising small changes here and there to make sure the job fulfills its potential and is the very best it can be – and our aim is always to exceed our clients’ expectations in everything we do.